Cool stuff you can use. : The Super Guide to Successful Blogging Launched - Get Yours Now! The Super Guide to Successful Blogging Launched - Get Yours Now! There are billions of blogs on the Internet and the number is likely to increase in the future as more people begin to understand the importance of the Internet and the opportunities that it provides. This is especially true in Africa and other developing regions of the world. Despite this increase in the number of bloggers, it is a very small percentage of them that are truly happy with their blog and what they have achieved with it. A lot of people blog to earn additional income, others take it as their primary job while others just want to share their thoughts and ideas. Businesses are realizing that blogs are a great way to connect with their potential and current customers. Regardless of your reason for blogging, it can be incredibly frustrating and sometimes depressing when your blog hardly gets any visitors. No wonder, many people abandon blogging altogether. However, this need not be so, with the appropriate information and guidance, just about anybody can be a successful blogger. 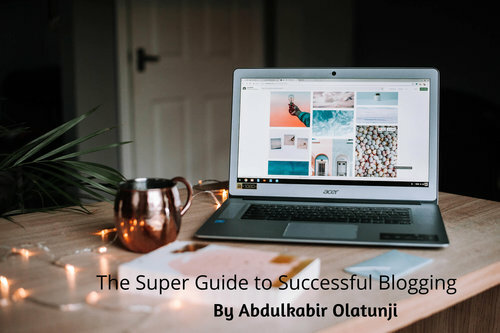 This is why, serial Internet entrepreneur and blogger, Abdulkabir Olatunji has written the book: ‘The Super Guide to Successful Blogging’. The book is written in simple language and guides you as a newbie on the steps you need to take to be a successful blogger. Upcoming and experienced bloggers will also find the insights in the book very useful. To show you how blogging can be done successfully, the book contains a breakdown of what successful bloggers like Neil Patel and Linda Ikeji did when they started and the things they are doing now to maintain their success. Search Engine Optimization (SEO) is essential to your success as a blogger and this book breaks-it-down for you in a way that you can easily implement to ensure the growth of your blog. This is the book you need if you are serious about being successful as a blogger and beginning your journey as a successful online entrepreneur or opinion leader. And if yow would like me to help you build your blog, please contact me on +2348085404500, you can send me a WhatsApp message too. As always great post, essential guide to consider for starting a new blog! I started my blogging journey on blogger, but self-hosted WordPress is best to start with! WordPress is better than blogger. . . And talking about Personal Branding actual 500-230 dumps; there is no doubt it works great!